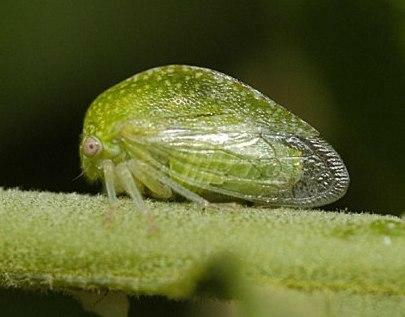 Region: This treehopper can be found throughout North America. Life cycle: This insect produces one generation each year and overwinters as an egg in the bark of trees, laid in September and October, and hatch in the spring. The hatched nymphs drop to the ground to feed. Physical Description: The 1/4 inch long, green treehopper has a distinctive triangular shaped hood that covers the head and part of the abdomen, and short, stout horns at each shoulder. The nymph is light green and has spines. The eggs are yellow and are laid in punctures in the bark of trees. Feeding characteristics: This pest attacks most fruit trees, potato, tomato, and rose plants. Feeding actually occurs on the ground where they eat plants, but the damage is caused by the punctures made in the plants for egg laying. Controls: If treehoppers are a problem, don't plant its favored plants like alfalfa, sweet clover, or other legumes as cover crops. A thorough spray of 4 percent dormant-oil in early spring will kill many of the eggs overwintering in, not on, the twigs. A dusting of the foliage with Diatomaceous earth is also helpful.